Konstantin Petrovich Pobedonostsev (Константин Петрович Победоносцев in Russian) (May 21, 1827 – March 23, 1907) was a Russian jurist, statesman, and philosopher. Usually regarded as a prime representative of Russian conservatism, he exerted tremendous influence over imperial politics during the reign of Alexander III of Russia, holding the position of the Ober-Procurator of the Holy Synod, the highest position of the supervision of the Russian Orthodox Church by the state. He upheld the authority of an autocratic ruler, and criticized Western democracy and Parliamentary politics. His conservative attitudes led to the Russification policies under Alexander III, which led to the persecution of the non-Russian and non-Orthodox, particularly Jewish, population. Pobedonostsev's father Pyotr Vasilyevich Pobedonostsev was a Professor of literature in the Moscow University. In 1841 he placed his son in the School of Jurisprudence in St. Petersburg, and upon graduating Konstantin Pobedonostsev entered the public service as an official in the eighth Moscow department of the Senate. At the same time in 1859 the Moscow University requested him to hold lectures in civil law, and he continued his scholarly activities while he continued to work in the eighth Moscow department. From 1860 to 1865 he was professor and chair of civil law in the Moscow State University. In 1861 Alexander II invited him to instruct his son and heir Nicholas in the theory of law and administration. On the April 12, 1865, Nicholas died, but Pobedonostsev was invited to teach his brother Alexander (the next tsar Alexander III). In 1866 he moved to his permanent residence to St. Petersburg. Relations of Pobedonostsev and Alexander remained very close for almost thirty years until Alexander's death in 1894. In 1868, he became a senator in St. Petersburg, in 1872, a member of the State Council, and in 1880, chief procurator of the Holy Synod. In the latter office Pobedonostsev was de facto head of the Russian Orthodox Church. During the reign of Alexander III he was one of the most influential men in the empire. He is considered the mastermind of Alexander's Manifesto of April 29, 1881. The Manifesto proclaimed that the absolute power of the tsar in Russia was unshakable thus putting an end to Loris-Melikov's endeavours to establish representative body in the empire. He always showed himself an uncompromising conservative and never shrank from expressing boldly his opinions. Consequently, in the liberal circles he was always denounced as an obscurantist and an enemy of progress. Despite his reputation as a conservative, he was involved in the liberal judicial statute of 1861 and corresponded with the intellectuals of his day, including Boris Chicherin and Fyodor Dostoyevsky. Pobedonostsev reached the peak of his influence immediately after the death of Alexander III, however his power declined as he lost much of his influence during the reign of Nicholas II. 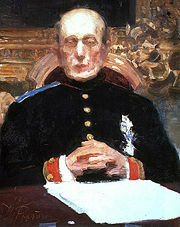 During the revolutionary tumult, Pobedonostsev, being nearly 80 years of age, officially retired from public affairs in 1905. Near the end of his life he was largely unpopular and had no close friends with the exception of Fyodor Dostoyevsky, whom he continued to correspond with. He died on March 23, 1907, from pneumonia in St. Petersburg. Although Pobedonostsev is mostly known as a statesman and thinker, he made a significant contribution to Russian civil law. He is generally regarded as one of the most educated Russian jurists of the nineteenth century. His main work was three-volume "Course of civil law" (Курс гражданского права). In addition, Pobedonostsev wrote articles on law, education, religion, and philosophy in various journals, such as the Moskovskie Vedomosti. In the sphere of practical politics he exercised considerable influence by inspiring and encouraging the Russification policy of Alexander III, which found expression in an administrative nationalist propaganda and led to the persecution of national minorities and religious non-conformists, particularly Russia's Jewish population. These policies were implemented by "May Laws" that banned Jews from rural areas and shtetls. Furthermore, he played a major role in creating a quota system that restricted the number of non-Russian and non-Orthodox students into universities. Pobedonostsev rejected the Western ideals of freedom and independence as dangerous delusions of nihilistic youth. Pobedonostsev maintained, though keeping aloof from the Slavophiles, that Western institutions were totally inapplicable to Russia since they had no roots in Russian history and culture and did not correspond to the spirit of Russian people. Futhermore, he denounced democracy in that a democracy, or Pariamentary methods of administration, cannot reflect the opinion of the people. Rather, such a small body of individuals fall into corruption and follow their selfish motivations in exerting their own will upon the masses. He went on to severely criticize judicial organization and procedures, trial by jury, freedom of the press, and secular education in his Reflections of a Russian Statesman. To these dangerous products of Western rationalism he advocated the necessity of preserving the autocratic power, which he maintained was the only way to represent the will of the majority, and of fostering among the people the traditional veneration for the ritual of the national Church. He supported the establishment of a network of parish schools for primary education, believing in the importance of a strong Orthodox, religious education. Furthermore, censorship policies were enacted under his influence to combat what he saw as the dangers of a free, liberal press. Adams, Arthur E. Imperial Russia After 1861; Peaceful Modernization or Revolution? Problems in European civilization. Boston: D.C. Heath, 1965. Adams, Arthur Eugene. The Ideology and Influence of K. P. Pobedonostsev (1881-1905). 1951. Basil, John D. Konstantin Petrovich Pobedonostsev: An Argument for a Russian State Church. Church History. 64, no. 1:44, 1995. Basil, John. K P. Pobedonostsev and the Harmonius Society. Canadian-American Slavic Studies. Revue Canadienne-Am̐ưericaine D'̐ưetudes Slaves. 37, no. 4:415, 2003. Byrnes, Robert Francis. Pobedonostsev, His Life and Thought. Bloomington: Indiana University Press, 1968. Pobedonost︠s︡ev, Konstantin Petrovich, and R. E. C. Long. Reflections of a Russian Statesman. Ann Arbor: University of Michigan Press, 1965. Shoob, Leo. Konstantin Petrovich Pobedonostsev A Study in Reaction. Thesis (Ph. D. in History): University of California, Berkeley, Feb. 1947. Sorenson, Thomas Calnan. The Thought and Policies of Konstantin P. Pobedonostsev. 1977. Encyclopedia article on Pobedonostsev (in Russian). History of "Konstantin Petrovich Pobedonostsev"
This page was last modified on 23 April 2018, at 15:42.